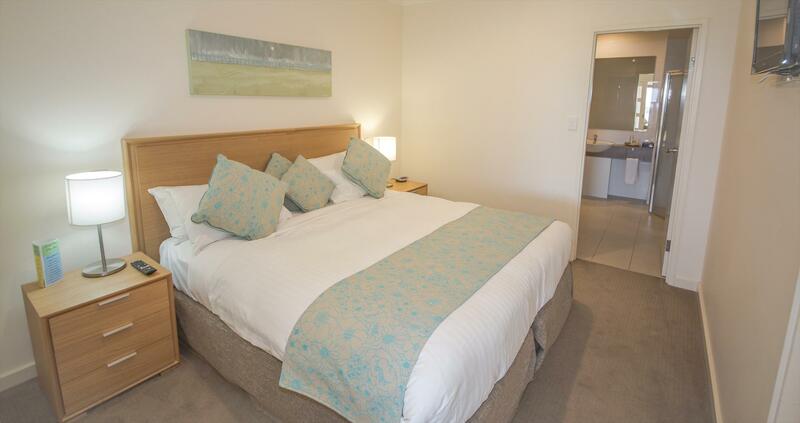 Situated on the cusp of the magnificent Lady Bay adjacent to the seaside town of Normanville you will find Links Lady Bay Resort. Complete with championship golf course and stunning ocean views the facilities are full of charm and quality, reflecting the unique character of the Southern Fleurieu. A stunning location offering superb dining, in-house day spa, gym, tennis courts, conference facilities, nationally recognised golf course and diverse local activities. Sand dunes, sweeping beaches, village atmosphere and so much of the lifestyle to absorb. This area is the home to the Leafy Sea Dragon, wine enthusiasts, being less than 30 minutes from McLaren Vale wine region, and charming local markets. Travellers from all over the world are drawn to this seaside haven and its pristine natural splendour. Links Lady Bay is located only one hour by car or bus from Adelaide CBD. Our one bedroom King Spa Suites are spacious and luxurious, all with large corner spas and private balconies. Each room is designed to embrace the natural space and surroundings that is the Fleurieu Peninsula. We have ensured that all of our guests are able to enjoy the stunning views over the 18 hole golf course and Lady Bay. Links Lady Bay Resort offers 28 spacious and luxurious one bedroom spa suites with large corner spas and private balconies. Each room is designed to embrace the natural space and surroundings that is the Fleurieu Peninsula. We have ensured that all of our guests are able to enjoy the stunning views over the 18 hole golf course and Lady Bay. Each room offers 1 king bed with the option of having the king bed split into 2 king singles. Please note split beds do incur a once off fee of $35.00. For additional guests there is a double sofa bed. Sofa bed incurs a once off fee of $35.00. Porta cots are available to hire. A once off fee of $10.00 applies & you will need to supply your own cot linen. Children stay free when sharing the king bed. Extra charges will only apply if sofa bed, porta cot and/or split beds required. Continental breakfast delivered to the room is available for additional $17.00 per person. All service changes/cancellations will be subject to a minimum $50 AUD cancellation / administration fee. Cancellation notified 3 days or more prior to arrival date will be entitled to a refund of the deposit / money paid less minimum $50 AUD. Full payment is due for bookings within 30 days of arrival date; failure to arrange payment will result in cancellation of the booking. Cancellations notified 30 days or less prior to arrival date and where the guest has entered an agreement to make final payment on the day of arrival the guest remains liable for the full payment. Payment will be invoiced to the guest and / or charged to any security held by this service. Cancellations notified 30 days or less prior to arrival date will forfeit the full deposit / money paid. When a booking has been made 30 days or less prior to arrival date and cancelled the full deposit / money paid will be forfeited. DAMAGES / SMOKING / CLEANING POLICY All services booked through Accommodation Getaways Reservation Service are subject to an accidental / willful damage policy a no smoking policy and an excess cleaning policy. Where the individual services confront interruption to business or unreasonable delay and expense in business operations the responsible guest will be charged accordingly. Travel insurance is recommended for all bookings to provide adequate protection against cancellation of travel. Getaways Reservation Service (Accommodation Getaways Reservation Service) is not responsible for changes errors omissions or misrepresentations made by owners operators or third parties booked through Getaways Reservation Service. ON CHECKIN YOU WILL BE REQUIRED TO GIVE CREDIT CARD DETAILS AS SECURITY TO THE OPERATOR. If extra guests do stay besides the number of guest you have paid for you will be liable to pay the additional extra guest charges applicable for that property.